I’ve really been painting some wonderful commissioned dog portraits. 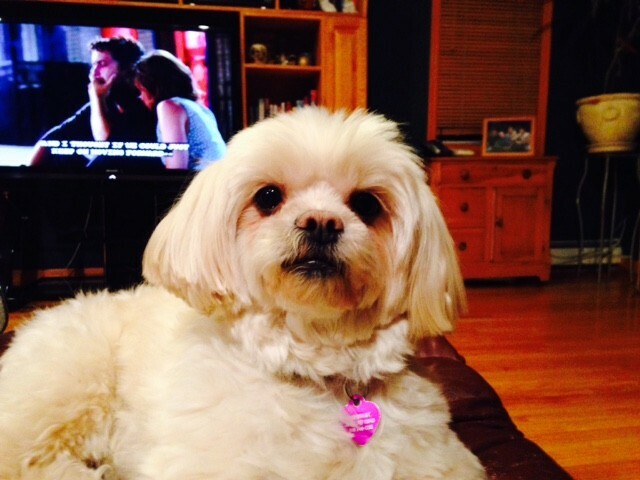 Today you’ll meet the Peekapoo – Zoey. I love her fur because it moves like human hair. And I swear she’s waiting for me to hold her, give her a treat, or something. So…I needed to learn about her breed. Well here it is. Enjoy, and I’ll keep you up to date on the next designer dogs breed. WATCH THIS VIDEO – If you don’t want to read. For a “designer dog,” the Peekapoo dog breed has a fairly long history; with the help of responsible breeders, it’s possible that the history will get longer still. A cross between a Pekingese and a Poodle, he was among the first of the recent slew of Poodle crosses to be developed, back in the 1950s and ’60s. He hasn’t gained as much recognition as some of the other designer dogs, such as the Labradoodle and the Cockapoo, but he’s won enough of a following that he’s thrived for the last five decades. 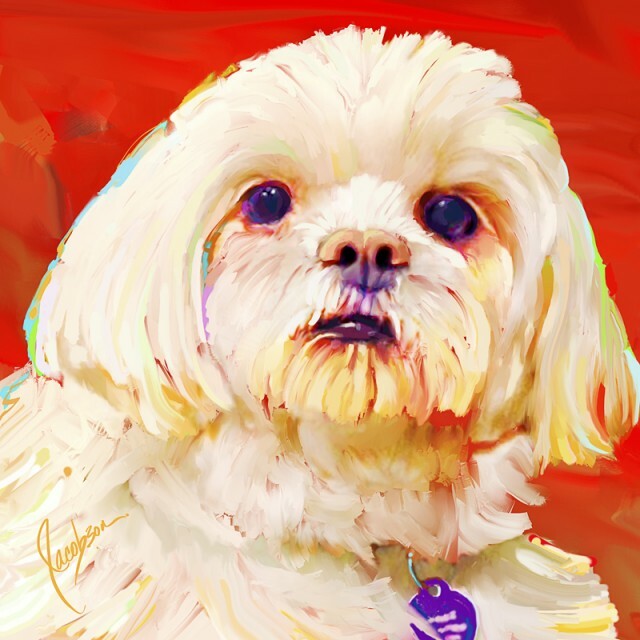 One possible reason for his success is that some designer dog breeders are trying to create a formal breed, whereas the Peekapoo folks believe that the best Peekapoo is still a cross between a purebred Pekingese and a purebred Poodle, and they don’t breed Peekapoos to Peekapoos. The Peekapoo doesn’t have a club or any organization trying to nudge him into recognition as a breed. This keeps him fairly clear of inherent diseases, although some still occur because a dog’s health depends on how well the breeder has selected the parents. Like most designer dogs, the Peekapoo was developed to be a companion forpeople with allergies. As with all designer dogs, some can still have coats that produce an average amount of shed hair and dander, setting off a person’s allergies. But even though designer “Doodle” dogs aren’t a perfect fit for those with allergies, the intelligent and affectionate Peekapoo steals many hearts and has made his way into a lot of homes and laps. He’s also begun to see success as a therapy dog. He makes an excellent watchdog and will bark without fail whenever he sees something or someone he thinks is suspicious. If you live somewhere with noise restrictions, this may not be the breed for you. He may be small, but he has a mighty loud bark. The Peekapoo is an outdoorsman. He fares best in a home with a fenced yard, although he can do well in an apartment. The Peekapoo should definitely live in a home with air-conditioning, because he can succumb quickly to heat exhaustion thanks to that flat-faced pedigree. He shouldn’t live outdoors or be left unsupervised outside. Proper exercise is a must; expect at least one walk and a good play session in the yard each day. He has a high energy level and if he doesn’t get his daily activity he can become destructive. A Peekapoo doesn’t extend his affections to strangers; he’s naturally suspicious of them, and they must earn his trust. A Peekapoo needs to be socialized to a variety of people and stimuli to be the well-rounded and affectionate dog that he can easily be. The Peekapoo generally gets along with everyone in his family. He does well with older, more considerate children, and he must be socialized and raised with children to be accepting of them. He behaves well with other dogs and pets, but again, he needs to be raised with them and properly socialized. Being a companion dog, the Peekapoo isn’t happy when left alone for long periods at a time. He can suffer from separation anxiety and become destructive when on his own. Your painting is so much better than the photo. This dog is alive and beautiful. Easy to see why he is your favorite. You did such a good job with this painting. Beautiful. Jeanie … you have the right to be biased. You have 4 of the most gifted dogs. Agility and more is how I think of them. How cute is that. VERY CUTE!!! !